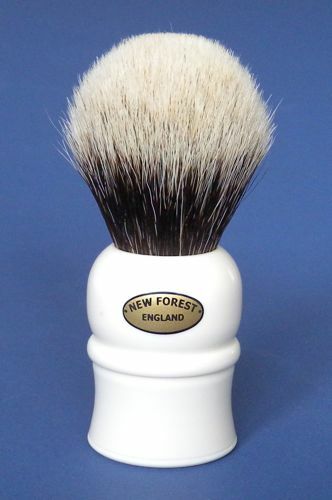 This brush is lathe turned and shaped by hand in the New Forest in high quality alternative bone. It has a 24 mm knot, 50 mm loft and 52 mm handle with a diameter of 39 mm. It has a very firm backbone with soft tips popular with face latherers for use with hard soaps. And it produces great results with creams as well. recieved your brush today ,looks stunning nice size in the hand ,lovely soft tips ,looking forward to years of service with it thanks again , ian. The two band hair used in New Forest brushes is commonly described by users as good as any other of the well known brands. Not surprising, because it is the same type of hair. Density is similar too.